A friend of mine sent me this photograph, taken at an exhibition directed at parents-to-be and parents of young children. It shows an anti-vaccination liar outfit that had somehow escaped my notice and which had decided to spread lies and misinformation to concerned and receptive parents. I felt dirty and polluted just looking at it and thinking that the parents of even one child might have been deceived into endangering their children (and other children too, of course) by accepting even an iota of the lies in the literature being handed out by these vile people. I decided a Kind & Gentle email was required so I sent the following to the expo organisers, copied of course to VAIS. I wouldn't want them to think I was talking behind their backs. 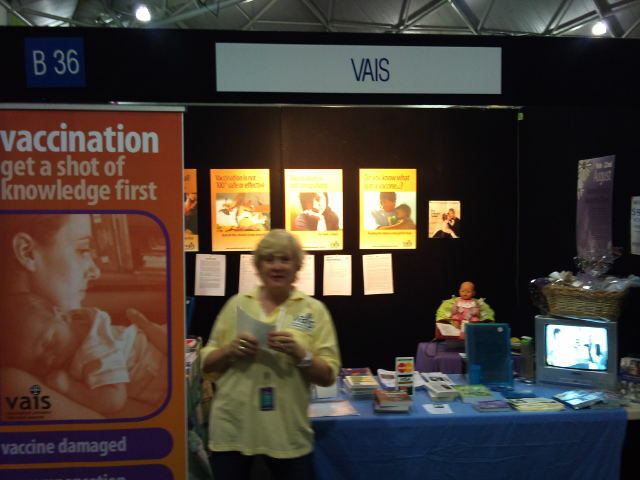 A friend sent me the attached photograph, apparently taken at this weekend's Pregnancy Babies & Children's Expo in Brisbane. I find it quite disturbing that an organisation whose sole purpose in life is to spread misinformation about vaccines and thereby endanger the lives of children should be given a voice at an expo dedicated to educating parents. A brief perusal of the VAIS web site shows the standard list of lies about vaccines that appears on many sites run by people and organisations promoting the anti-vaccination agenda, and there are also many links on the site to these other places, as if repetition of a lie can make it true. Children are dying in Australia now from vaccine-preventable diseases, diseases that we thought we had seen the last of. A significant reason for the re-emergence of these diseases is the activity of organisations like the deceptively-named "Vaccination Answers Informed Sources" and the Australian Vaccination Network. Please do not allow VAIS or similar organisations to take space at future expos. Parents who attend your expos deserve better than to be confronted with people offering advice that will put their children in danger of serious illness and even death. The children deserve better than having the greatest advance in children's health in the history of medicine denigrated and lied about by people with some inexplicable agenda against child and public health. Vaccines save lives. Anybody who says otherwise has as much credibility as someone who insists that the Earth is flat. The difference is that belief in a flat Earth doesn't kill children.